It’s fall, y’all! Though it might not feel like it, it is. Swear. You can tell it’s fall because alllll the events are popping up. Honestly, at this rate, my friends and family won’t see me until winter. Harry Potter Trivia at Flying Saucer: Tuesday, Oct. 23, at 7:30. Don’t come dressed as muggles, PSA. More. Harry Potter Trivia at Eureka Heights: Thursday, Oct. 25, at 7 pm. Students, please review Goblet of Fire, chapters 1 to 18 and the movie before returning to class — said in a Professor McGonagall voice. More. Houstonia’s Woman Up! Friday, Oct. 26, to Saturday, Oct. 27. Speaker series and fun events all aimed at empowering women of Houston! Learn more. Tacolandia: Saturday, Oct. 27. All the tacos one can dream of at one event. Get your discount tickets here! 11th Annual Mutts, Meows, Margaritas and Monsters: Saturday, Oct. 27, at 6:30 pm. Mmmmm, mmm good. This event benefits BARC, a really terrific animal nonprofit in Houston. More here. Moonlight Bicycle Ramble: Saturday, Oct. 27 — we ride at midnight. This low-key, badass event entails riding bikes in a group at midnight to raise awareness of bike safety. Seems legit. Oh, yeah, pregame at Saint Arnold’s. Cheers. Trick or Treat market at Karbach: Sunday, Oct. 28, at noon. Shop, spook, drink, continue. More. Hocus Pocus at Axlerad: Tuesday, Oct. 30, at 7:30. Beers and the three babes every Halloween party needs. More. 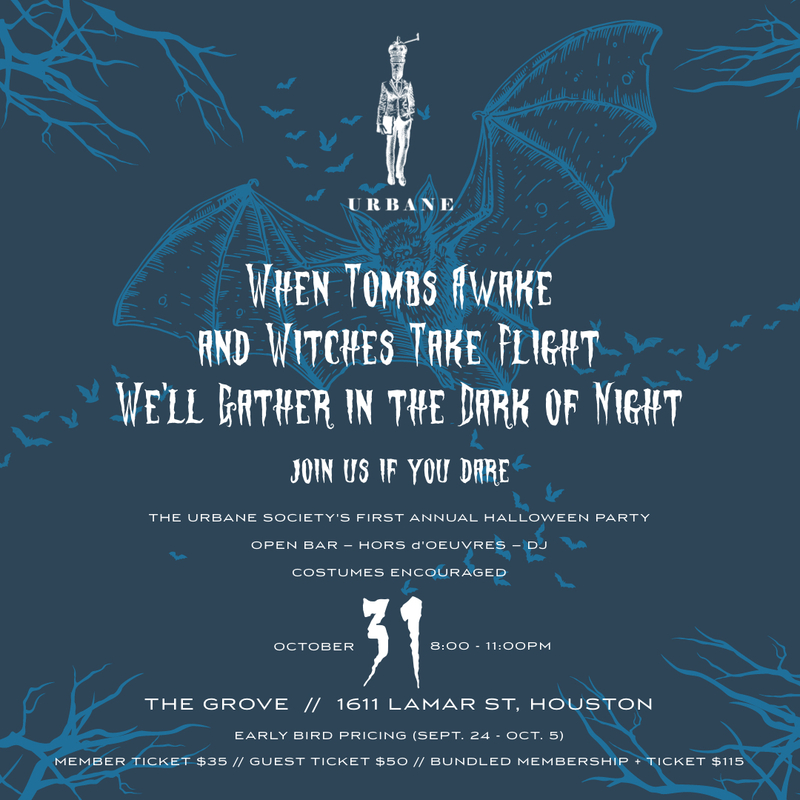 Halloween with Urbane Society! Wednesday, Oct. 31. 8 – 11 pm at the Grove in Downtown. Tickets are $45-$60 depending on if you’re a member or not (We are! Sign up here). Get excited for an open bar, DJ, heavy hors d’oeuvres and costumes galore! Get your tickets soon before the event sells out! Oktoberfest in Houston: Plenty of great events all month long. Click here to see all that there is to do! Texas Renaissance Festival: Every Saturday and Sunday all month long and through November! We wrote extensively about the super fun festival. Check it out! Bluefield Market in EaDo: Every Saturday evening from 6 to 10. Free yoga at 6, then music and shopping local! More here. Open House, the latest installation from Havel Ruck Projects, is now on view at Sam Houston Park daily from dawn until dusk. For the site-specific installation, artists Dan Havel and Dean Ruck transformed a small house into an interactive public sculpture that nods to Houston’s past and present. The work is part of the Houston Downtown Management District’s Art Blocks initiative. Registration is open for Turkey Trot! Use our code for 30% of your ticket to earn your turkey! Code is: “30HOU” and click here to sign up. Menil Collection Reopened: After a seven-month hiatus, the iconic Renzo Piano-designed main building will reopen with entirely new displays of artwork drawn from our permanent collection. The Menil’s most loved paintings and sculptures will be presented alongside promised gifts, recent acquisitions, and artworks that have never before been on view. More. Boxcar Bourbon Tour: Wednesday, Oct. 3, and Thursday, Oct. 4.The Bourbon Legends Boxcar Tour is making its way across America and is coming to Houston! This unique pop-up will be one’s ticket to the world of America’s native spirit, allowing guests to explore the taste, process, and places behind some of the most legendary bourbons in the world. In addition to getting an insider look at the world of Kentucky bourbon, you’ll have the chance to sample iconic bourbons from the legendary labels themselves. Secure your tickets here. Mean Girls Trivia at Under the Radar Brewery: Wednesday, Oct. 3, at 7:30 pm. On Wednesdays we wear pink. On October 3rd, he asked me what day it was. That’s so fetch. Would you like us to assign someone to butter your muffin? Get in loser, we’re going trivia-ing. Greekfest: Thursday, Oct. 4, to Sunday, Oct. 7. Greek food, wine and fun is taking over Montrose! Click here to learn all about it! Adult Swim Art Show + Market: Friday, Oct. 5, at 7 pm, at Insomnia Gallery. Fan art, free beer and a fun time. Say hi to my sister-in-law, Erin Harms! She’s got some killer stuff! Nerd out. The Depressed Cake Shop: Sunday, Oct. 7, from 1 to 4 pm. at Silver Street Studios. Kicks off I’ll Have what She’s Having (see below) with fun pastries! More here. Dressember Houston Meet and Greet: Friday, Oct. 12, from 5 to 8 pm, at Eureka Heights. It’s Not Hou is cohosting this fundraising networking event! Come learn more about Dressember Houston and how to get involved. Plus, Eureka Heights is donating 10% of its profits for the whole night! Tell all your friends! More here. I’ll Have What She’s Having: Sunday, Oct. 7, to Saturday, Oct. 13. A week of events put on by Houston hospitality ladies fundraising for women’s health issues. Learn more here. Punch Party at Reinzi: Friday, Oct. 13, at 7 p.m. Take the opportunity to learn from and be mentored by successful women – and take the opportunity to give back to other women. Tickets are $40 and include drinks, bites and admission. Click here for more. The Market at Sawyer Yards: Saturday, Oct. 13, at 11 am, at Sawyer Yards. Surrounded by the highest concentration of working artists in all of Texas, the market coincides with 2nd Saturday Open Studios, when artists from The Silos at Sawyer Yards, Winter, Spring, Summer and Silver Street Studios, open their studios to the public. More deets here. Fall Wine Festival at Brenner’s on the Bayou: Saturday, Oct. 13, 3 to 6 pm. Delicious bites, premiere wines from across the country and live music. Cheers! Bayou City Arts Festival: Saturday, Oct. 13, to Sunday, Oct. 14, in downtown Houston. Come out and support local artists! You can buy incredible pieces from the artist right there! More deets here. Yoga with Kittens: Sunday, Oct. 14, at noon, at Yogaleena. No downward dogs allowed. Only cats and the occasional cow. (These are yoga jokes, btw.) Meow. moonGARDEN installation in Discovery Green: Until Oct. 7. A series of 22 illuminated spheres transform Discovery Green and the plaza at Avenida Houston into a magical moonscape. Ranging in size from six to 30 feet in diameter, moonGARDEN features 11 shadow “theaters” that tell the diverse, dynamic story of Houston and Discovery Green, as well as interactive works that allow visitors to become part of the experience. This is the largest ever created by Lucion Traveling Light of Montreal. On opening night, see Cirque la Vie and other performances throughout the park, a screening of Moonstruck (1988, PG, 102 min.) and more from 7:30-10pm. Learn more. Ted V. Beto at Axelrad: Tuesday, Oct. 16, at 7:30 pm. The battle royale will be at the University of Houston, so watch down the street at a bar with access to beer and pizza. Fight on. Talk, Dance and Drink Like A Texan: Wednesday, Oct. 17, at Karbach, from 6 to 9 pm. The out-of-staters need not apply. Yeehaw. The Pink Party: Thursday, Oct. 18, at 6 pm. Benefit breast cancer research and awareness at this stylish nonprofit event. Think Pink. Mixed Media at MFAH: Friday, Oct. 19, at 8 pm. Drink and jam with the Tudors to celebrate the opening of the Tudors to Windsors exhibit. Admission is $25 and drinks are usually around $7 or so. Let’s party! Amberfest at Under The Radar Brewery: Sunday, Oct. 21, noon to 6 pm. Drink beer and hang with this blockparty of sorts! Tickets are $20. Cheers. We’re constantly updating this post — check back later for more events and drop us a comment if we missed something fun! Tags: charity, fall, houston events, Nonprofit, October. Bookmark the permalink.